Dan has a BA and Masters Degree in Social Science, and a PhD in Systems Thinking. All of which cost him 30 years of unbroken formal schooling and left him with little sense he could actually change things in the physical world. 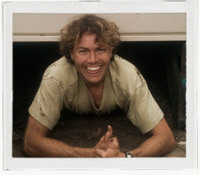 In 2005, Dan completed his first Permaculture Design Certificate hosted at Melbourne University, and he was more excited by what he learnt in those two weeks than the other 30 years combined, so he decided to lose the suit he often wore as a consultant, and begin donning the gumboots. His teachers and mentors have included permaculture founders Bill Mollison and David Holmgren, as well as Darren Doherty, Geoff Lawton, Rick Coleman, and Rosemary Morrow, the last of whom he spent seven months teaching and implementing permaculture in Ethiopia and Uganda. Dan is constantly co-founding things (such as Permablitz, Holistic Decision Making, and Living Design Process). 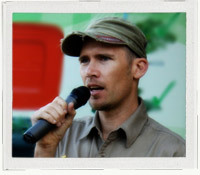 Since 2009, he has been a professional permaculture designer, educator and landscaper with VEG. While Dan and his partner Amanda and daughters Ciela and Nikkal currently live in Castlemaine, Central Victoria, they might one day abscond to the seven acre permaculture paradise they’ve been developing with Dan’s folks in New Zealand. 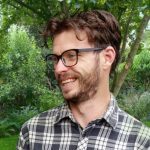 Recently Dan’s been incorporating some of his system thinking back into permaculture and you can check out his thoughts on the future of permaculture at his blog: Making Permaculture Stronger. Dan has also written a personal perspective on the beginnings of VEG here. Adam sometime describes himself as a ‘recovering geek’. In the early 2000s he started thinking about energy depletion, and he soon left a career in IT to pursue becoming backwardly mobile. He founded the global energy news clearinghouse Energy Bulletin (now Resilience.org) in 2003. 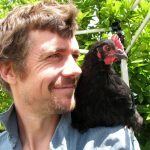 He got into permaculture in 2004 and helped Dan to get the now global permablitz movement off the ground in 2006, which he’s been active in ever since. 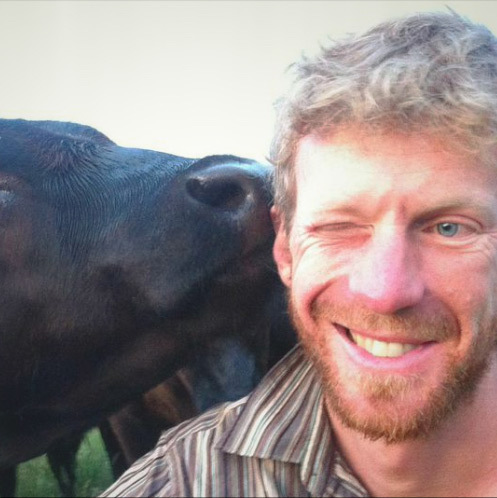 As part of VEG, he’s now facilitated hundreds of permaculture designs and related workshops. He is known as a wild food enthusiast, runs popular edible weed walks, and is co-author with Annie Raser-Rowland of The Weed Forager’s Handbook (Hyland House, 2012) which has helped over 15,000 purchasers get in touch with their inner hunter-gatherer. He also considers himself something of an indulgent cheapskate, and helped Annie co-author The Art of Frugal Hedonism: A Guide to Spending Less While Enjoying Everything More (Melliodora, 2016). You can hear him on Tuesday nights on Melbourne’s 3RRR hosting the permaculturish-themed show Greening the Apocalypse. His teachers have included luminaries such as David Holmgren, Bill Mollison, Darren Doherty, Joel Salatin, Elaine Ingham and many others. He has been a caretaker of permaculture co-founder David Holmgren and Su Dennett’s Melliodora property, and has collaborated with David on his Future Scenarios work. He looks after some bees, and lives in a beautiful garden in inner Melbourne known for its prize bananas. If you head down to our Brunswick warehouse Jeremy is likely the immensely personable man you’ll be lucky enough to meet. With over 20 years horticultural experience, including seven years at Melbourne’s Royal Botanic Gardens, we were delighted to have Jeremy join the team in early 2016, because he brings competence, enthusiasm and all round good vibes in equal measure. (Although he probably misses being able to grow vanilla beans and cacao pods like he could in the Botanic’s giant glasshouse.) Jeremy is an adept of West African drumming, and has travelled to Africa learn his art. When he completed VEG’s Permaculture Design Certificate in 2016 he fired up the campfire with irresistible rhythms. Jeremy keeps the VEG Warehouse in order, teaches wicking bed workshops, and manages our wicking kits and veggie bed installations, all of which you can find out more about at our website: wickingbeds.com.au. Brendon came knocking on the VEG door in 2017 after meeting Dan on an Advanced Design course, and we’re sure glad he did! With unsurpassed thoroughness, a love for moving bulk materials and a deep commitment to edibilising the landscape, Brendon has been bringing his enthusiasm and skills to VEG ever since. 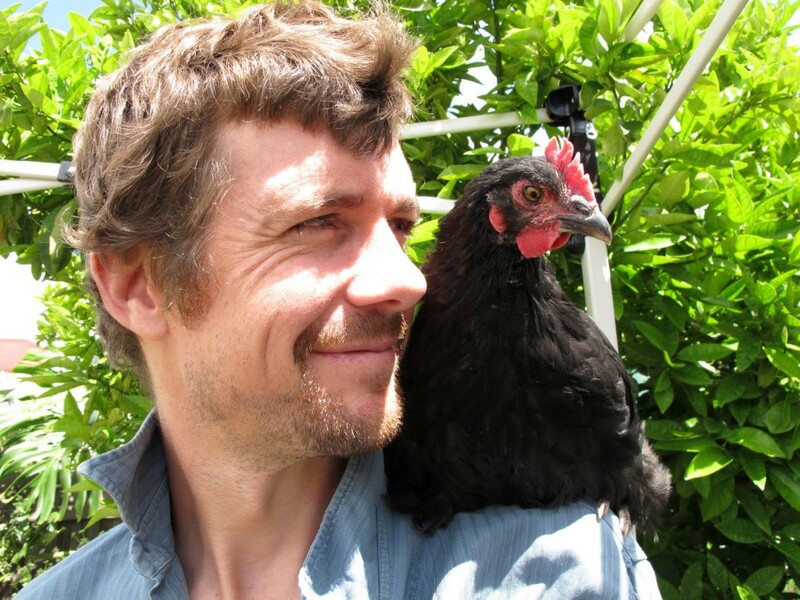 From his first encounter in 2005 with the Permaculture Designers Manual at the local library, he’s spent loads of time learning with some of the best known exponents of permaculture, and has since grown his own edible design business Inspired Abundance. 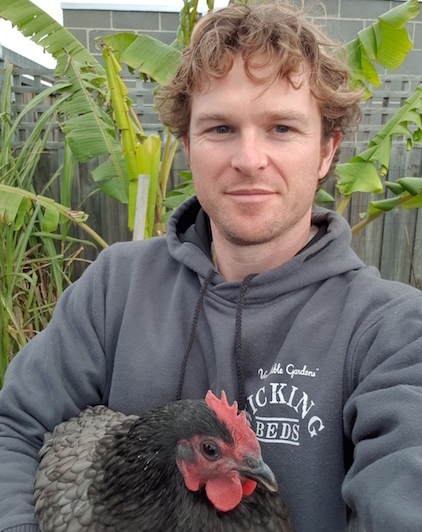 When he’s not busy transforming the suburbs into one giant edible landscape you’ll most likely find him hanging out with his chooks, who form an integral part of his dynamic home-based economy, which includes bees, market-garden style veggies, fruit trees and a frog pond (replete with edibles of course) – check out his Instagram channel for what’s happening this season. One of the problems with employing extraordinary people with brains and passion is that they often have dreams of their own and go on to do bigger and better things. Here’s a few of the people we’ve worked with over the years. 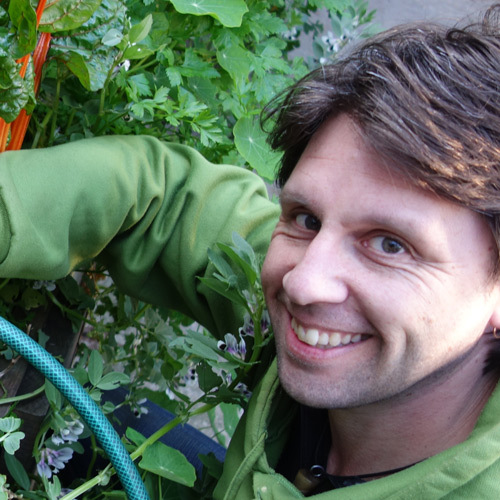 As one of the four founders of VEG, Nathan is an experienced permaculture designer and has also been employed by the Stephanie Alexander Kitchen Gardens Project at a Northcote Primary School. 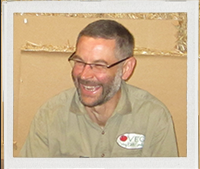 Nathan completed his first Permaculture Design Certificate at Crystal Waters Permaculture eco-village in 1999 and his second in 2006 with Bill Mollison and Geoff Lawton in Melbourne. Since heading for the country and leaving VEG, he has owner-built and developed his 10 acre property in Castlemaine along permaculture principles, and doesn’t come to help us out in the city anywhere near as much as we’d like him to. Nathe is a renaissance type and these days he makes a living building, consulting and teaching his formidable musical skills to youth in detention. Will has cycled around Australia, worked on a sailing boat in the Mediterranean Sea and volunteered on a permaculture project in Africa. His love for eating fresh food and dedication towards self-sufficiency and the human-powered concept are driven by his triathlon and cycle commuting lifestyle. His passion for life and life long learning show through his willingness of character and unstoppable enthusiasm. 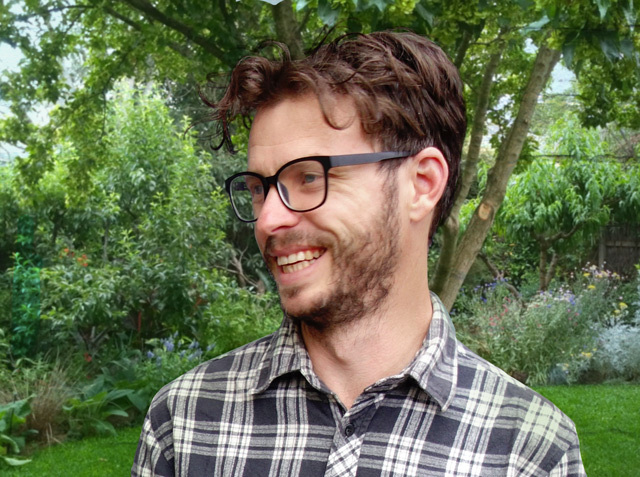 Will has a degree in Industrial Design and has done two Permaculture Design Certificates, and is a powerful force physically and with good vibes in VEG. 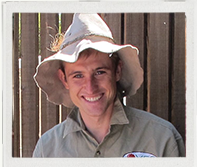 When he’s not working with VEG he also manages the gardens and runs workshops at the Port Philip Ecocentre. Read more about Will here. We were so sorry to see Will leave us in 2015 but stoked to see him returning to his hometown of Newcastle and we wish him all the very best of luck! You used to be able to find Paul in the VEG warehouse on Tuesdays where he joined bits of wood together. These days Paul is running his incredibly cool Farmer Incubator project, and growing vegetables in Keilor at his Day’s Walk Farm. We used to call him Farmer Paul of FP for short, kind of ironically since it was merely a dream back then. But it’s a full reality now! Check out this profile of Farmer Paul we put together back in 2014. Kim’s and her partner Clive’s large backyard in Heathmont was one of Dan’s first ever professional design projects, and Kim and Clive both quickly became more than clients: initially friends, and later Kim became a colleague, running workshops for VEG from her home. Kim also helped run the Greater Dandenong Edible Gardens Project which saw permablitzes and workshops being rolled out through the municipality. Kim is ever the adventurer and has spent the last couple of years travelling but we’re hoping to have her back in the fold one day. An architect by trade, Matt to our good fortune, jumped ship in to landscaping and with Josh formed the core of our installation team. He’s is a good-natured gun – more organised than any of us and always calm, professional, and the guy that sees the job through to successful completion time after time in style. Matt is father to two lovely kids we get to hang out with at VEG social gatherings and is a keen veggie gardener and chook keeper. Matt is back working as an architect, so let us know if you’d like his contacts! Read more about Matt here. We love Josh who always brings a smile and a rural-born practical know-how to his work with VEG. Our customers regularly take the time to contact us sharing how much they have enjoyed Josh’s presence in their garden and we know why – he’s just super lovely! Here’s a few words from the man himself: “G’day my names Josh Tucker. I am a proud member of the Veg crew. I love making things grow and working on projects. I help build things in peoples backyards and am quite sure we do great things. I also enjoy working as an outdoor leader and camping/ travelling with my fiancée. I am part of a community garden called Produce with a Purpose and I feel very lucky to have my current life.” Josh now lives in the Yarra Valley with his now-wife Louise where they are starting a market garden. Carey rocked up to the second ever permablitz so has been part of the loop since way back. He held Dan’s hand on our first ever professional design in Melbourne, attended the very first meetings that later became VEG, and in the last four years or so has become a real VEG mainstay. 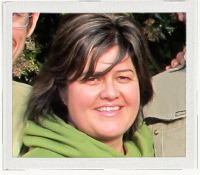 Carey was behind getting the VEG warehouse off the ground, and has been a core designer and educator. Sometimes dubbed FC for Farmer Carey, he for several years developed his farming skills on the 30 acre 40-Kay Farm in Melton, and he’s currently farm managing a 400 acre property in Gisborne, just minutes from the city fringe. Carey is inimitable – he lives his life with a set of values that we can only try to emulate – and he’s about the most personable human you’re ever likely to meet. Read more about the one and only FC here. Cassie mixed it up with helping Carey present workshops, helping the VEG PDC, and installer and warehouse assistant over at VEG Wicking Beds.